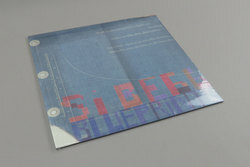 Si Begg - Blueprints. Vinyl LP, CD. Bleep. Berlin’s legendary Shitkatapult come through with the latest release from the producer’s-producer of producer’s-producers. For his sixth solo LP, Si Begg utilised analog synthesisers, effects units and the interference sounds from his phone and hard drive. The result is a record that coaxes great depth from the tools used to make it. Many of the tracks here hum and whirr in a manner that suggests bursts of energy or creativity are never far around the corner. Begg’s wealth of experience in scoring for film and television also comes in handy on the likes of ‘Heat Resistant Alloys’ and ‘Energieerzeugung’, both of which contain the sort of coiled-spring tension that one could imagine soundtracking something high-stakes going down on-screen.